Originally published in VICE Magazine, March 6, 2016. That’s what I read about Rapa Nui in the in-flight magazine as I made the five-hour trip from Chile out into the vast emptiness of the Pacific Ocean. 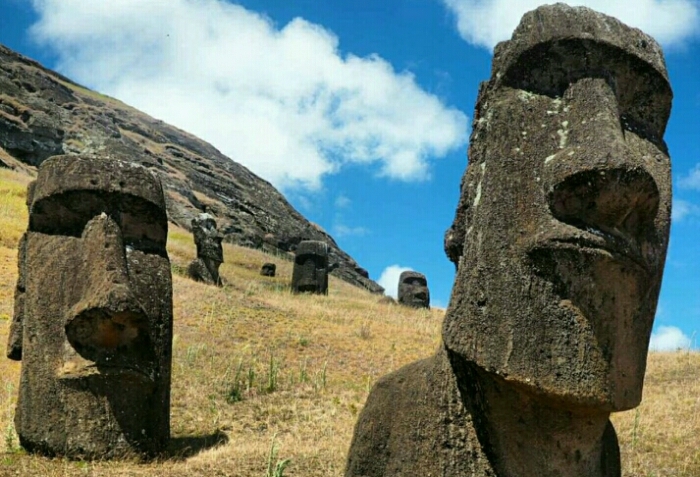 It’s more commonly known as Easter Island, commemorating its Easter Day discovery by the first European visitors who came aboard a Dutch ship in 1722. What its captain, Jacob Roggeween, found was a Polynesian people long since cut off from the rest of humanity, covered in tattoos and encircled by mysterious stone faces erected all along the coast. Their expressions stoic, their backs to the sea, they stood silently. Guardians looking in and down toward the people. 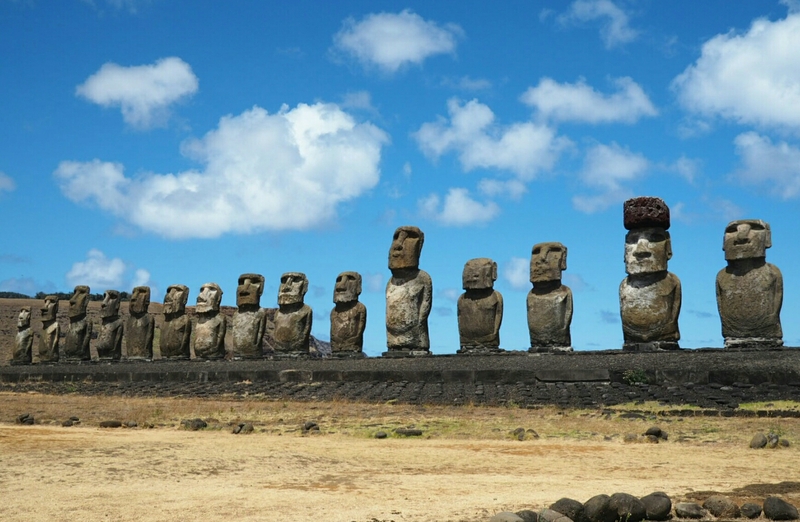 They are the moai statues that have long since become synonymous with Rapa Nui and put it on the map. Although, having said that, most people would be hard pressed to point to where it’s supposed to be on a globe. I know I couldn’t before I came here. More than 2,250 miles from the nearest point of South America and another 2,500 miles from Tahiti, to this day, Rapa Nui society remains largely unknown by even the most intrepid traveler. Sure, the megalithic sculptures have been depicted often enough to look familiar. But the island, born out of the ocean by a series of violent volcanic eruptions, has so much more going on, in scenery and in culture. Millennia of Polynesian traditions have risen and fallen here. The Tapati festival, which takes place for two weeks every February, is the clearest reflection of this vibrancy. This is why I’d come. “Iorana korua [hello, everybody]! I welcome each of you, and communicate a message of love and hope.” A cloaked man moved his hand, gesturing to the crowds assembled for the festival’s opening ceremony in the tiny, laid-back capital of Hanga Roa. The stage lights and the moon illuminated the symbols painted on his skin in white, black, and brown, and the feathers and dried grass of his traditional dress rippled in the sea breeze. It seemed like most of the island’s population of 5,800 people—along with hundreds of tourists—were all there with me at that beautiful venue. Palm trees were swaying silhouettes around us, just out of reach of the waves. Rising smoke from the pop-up barbecue stands faded around beautiful women with garlands of flowers in their hair. “We will remember during this festivity and show the world our ancestral arts and the cultural, social, and artistic legacy that our ancestors passed onto us,” he continued before gesturing to a heap of large leaves and stones on the ground: a feast offering. 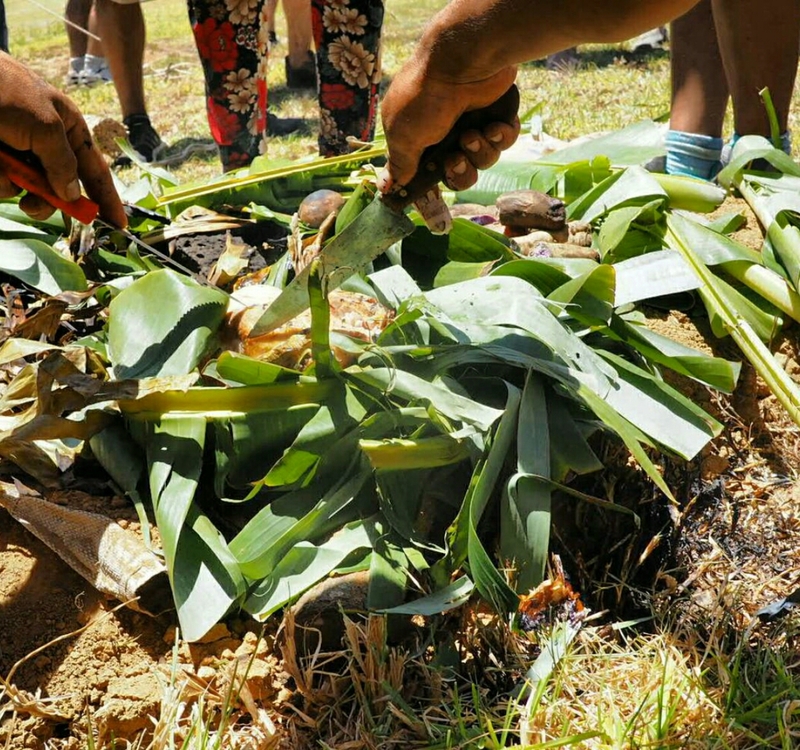 Called an umu pae, meaning “food under earth,” it’s the process by which the Rapa Nui traditionally cooked food in small underground ovens dug into the earth. A communal enterprise, it’s organised by island families, long observed as an entreaty to their ancestral god Make-Make for blessings for important events. 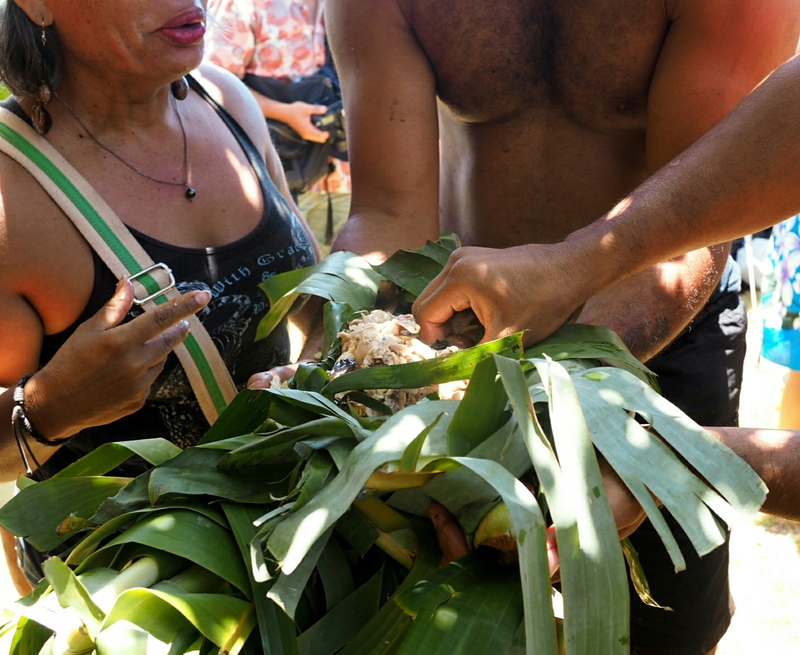 It’s practiced in other parts of Polynesia too, but the form of preparing it on Rapa Nui is closer to curanto, a Native American Mapuche tradition in the south of Chile. One theory is that the early Polynesian colonizers of Rapa Nui reached southern Chile by boat in the pre-Hispanic period, bringing the curanto tradition to their eventual homeland. It starts off as a dugout pit lined on the bottom and sides with volcanic stones, which help regulate the temperature. A fire is lit. Banana leaves cover the base, on top of which a layer of meat is placed. This is covered with more leaves and then potatoes or taro, as well as poe, a dense local cake made from banana, taro, or pumpkin. More rocks, leaves, and finally earth cover the subterranean oven, which is marked by a ring of smooth stones. The first night’s offering went to the front row dignitaries. But I was told the sharing of food to family and strangers alike would continue over the next two weeks, to seek good luck for the upcoming Tapati competitions. It was a memorable sight. The hours passed, and with the afternoon sun glaring down, the winners were crowned with wreaths of flowers on their sweating brows. Their next reward was lunch, which had been cooking away beneath the earth while they’d been competing. Thankfully, even those of us whose only exertion had been changing camera lenses got to get involved, too. 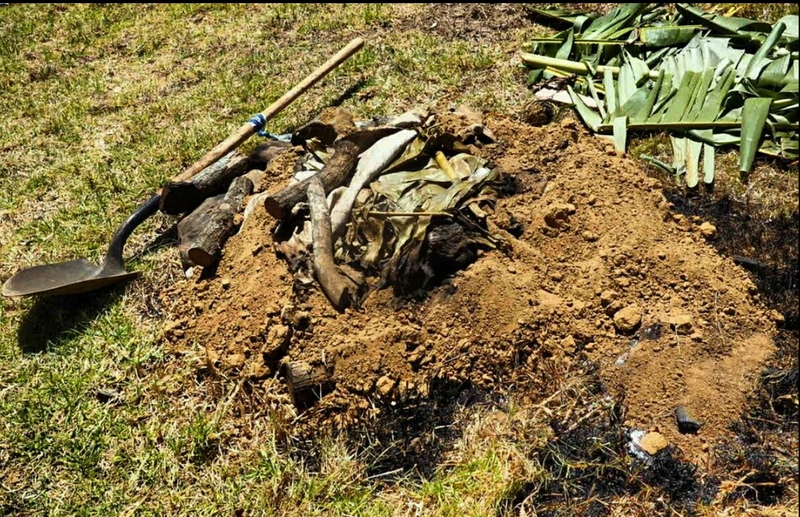 Gathering in a circle around the umu, a woman grabbed a spade and uncovered the topsoil, revealing the first layer of banana leaves. These were gingerly moved aside and the smell of the first hot steam from the roasting chicken nestled below shot upward. More people moved over to join the circle. Organizers and competitors gave a Rapa Nui blessing, and further layers of the umu were peeled open. The knives came out and the moist chicken, taro, potatoes, and banana cake—all tasting partly roasted, partly barbecued—were cut up to be shared among us. It was such an enjoyable end to a fun, fascinating spectacle. “Make sure to have another piece,” insisted one of the triumphant competitors. Trying not to burn my fingers, I thanked him, already looking forward to the next Tapati event. But why are such efforts to conserve these skills and sports—some of which no longer make up part of everyday life—so necessary? Since Rapa Nui’s introduction to the rest of the world, a sad series of calamitous events almost completely wiped out its people. The first meeting with the Dutch did not go well. They reportedly wasted little time in murdering nearly a dozen islanders within the first half an hour. And it didn’t get much better from there. Their isolation, although enabling the undisturbed development of a distinct culture to prosper, also came at a cost. The Rapa Nui were entirely unprepared for the putrid, fetid diseases of a continent they had no inkling of. European illnesses like syphilis struck at what must have been a terrifying pace, killing thousands, and leaving bewildered survivors to wonder what was next. What did come, uninvited and horrifying, was the scourge of slavery. Peruvian raiding parties stole some 1,500 people during 1862, then a third of the population. Within a year of forced labour in South America, all but 15 had died. The disastrous tale continued as they were transported back to Rapa Nui, infected with smallpox. By the 1870s, when a census was taken, the total population had fallen to just over 100 people. The Rapa Nui had come within a hair’s breadth of extinction. Annexed by Chile in 1888, many of today’s population of nearly 6,000 have some Chilean ancestry. 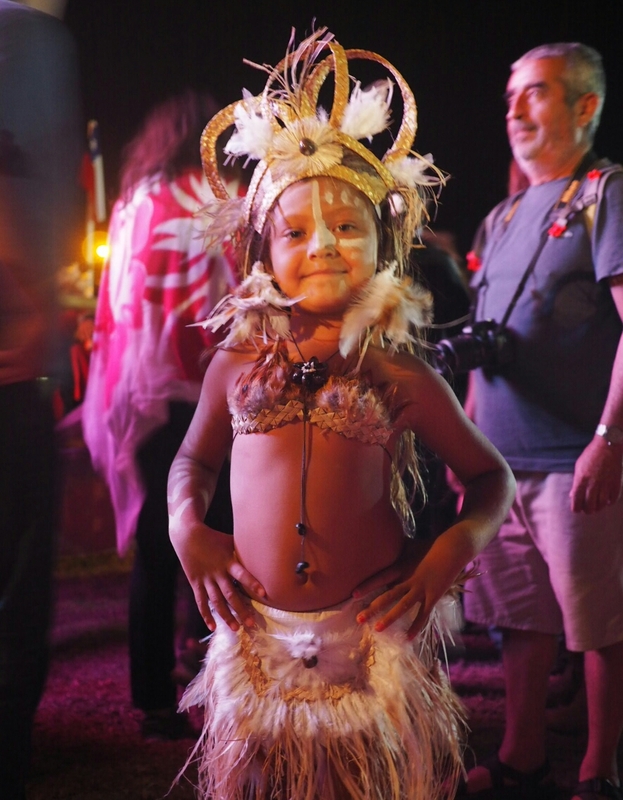 Still, 60 percent can claim indigenous Rapa Nui heritage. 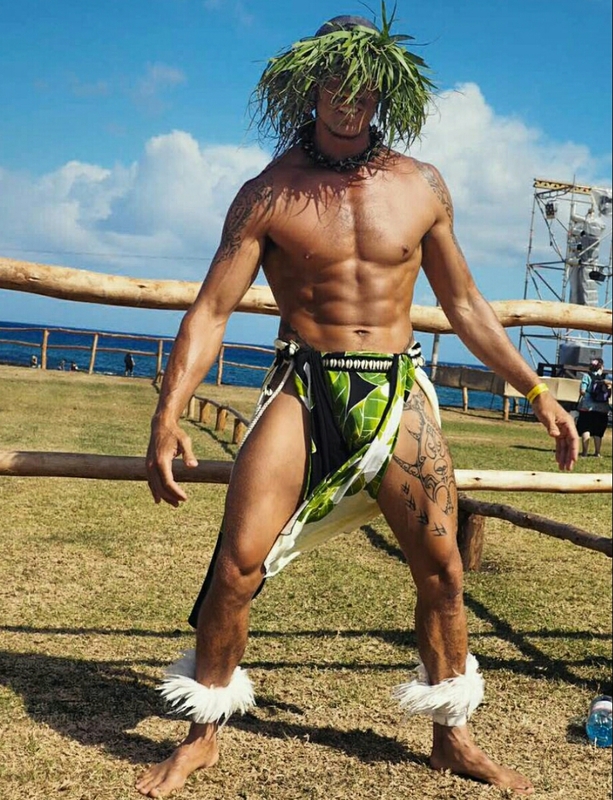 No wonder, then, that they take so much pride in saving Rapa Nui traditions through annual renewal. Fortunately for visitors, umus aren’t just consigned to one annual festival. Ever since Catholic missionaries converted the population in the 19th century, they are also organised to celebrate saint’s days throughout the year. Families collaborate with a priest, who announces the event during mass, urging people to come along. Sometimes as many as 500 hungry guests will attend. There’s no need to be shy: You can step into the main church in the capital and just ask when the next umu is on. Against the weapons and the germs of an encroaching modern world, this custom has survived. So, if you plan to visit Rapa Nui, make sure to join in, and eat a slice of Polynesian history.